I must admit I was going to give up before I ever started because there were 13 ingredients involved in the recipe. That many ingredients= chaos in my mind and on my counter tops. After looking up many recipes I finally found one that had all of the right ingredients and seemed the easiest. 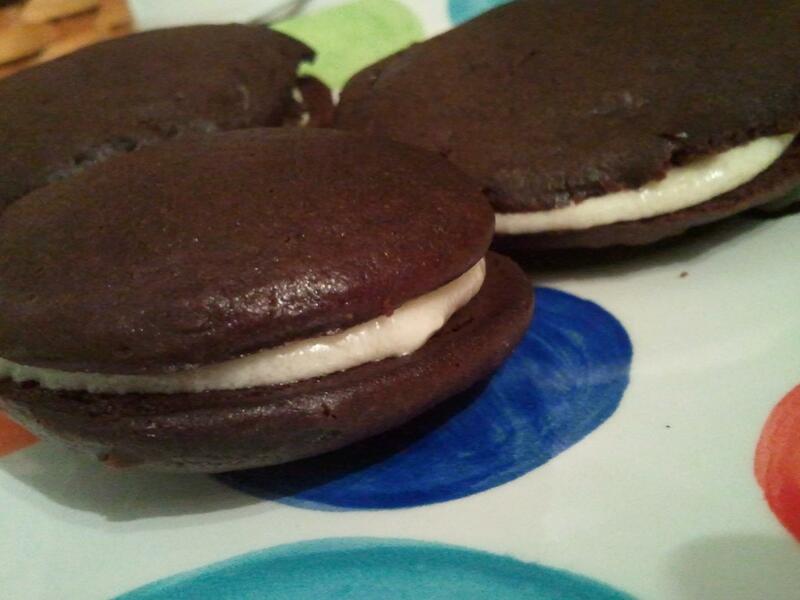 Good luck if you attempt to try your hand at Whoopie Pies. I would love to see how yours come out! Cream shortening and sugar. Combine beaten eggs, milk and vanilla and beat into creamed mixture. Slowly stir sifted dry ingredients into the creamed mixture, and beat on medium speed about 2 minutes. Drop with tablespoon onto greased and floured cookie sheet (enough dough to make a baked cookie about 2 to 2 1/2 inches). Bake at 350 degrees until cookie just springs back when pressed in center with finger. Remove to rack and cool completely before filling. Beat until creamy. Add vanilla and salt (dash).Mix sugar mixture with the milk and flour mixture. Stir until smooth or beat on medium speed until fluffy. This entry was posted in 101 in 1001, Uncategorized and tagged 101 in 1001, food, recipe. Bookmark the permalink.